Sept. 21, 2015, 9:45 a.m. Built by NBCUniversal News Group, NewsConnect, is a dashboard that centralizes information and reporting for all of NBC’s platforms. By Joseph Lichterman @ylichterman Sept. 21, 2015, 9:45 a.m.
Across all of its platforms, in both digital and broadcast, the NBCUniversal News Group — NBC News, MSNBC, and CNBC — employs thousands of journalists and publishes hundreds of stories each day. With so much reporting going on, it can often be difficult for staffers to know for sure what’s going on in other parts of the organization. But as part of a larger effort to promote better communication and streamline how information is shared across its newsrooms, the company this summer released NewsConnect, a centralized platform that lets staffers throughout the organization share information and story updates. An average of 900 NBCUniversal News Group employees now use NewsConnect every day. “Unless there’s a reason for the organization not to know what you’re doing…it should be out there to be shared,” said Mark Lukasiewicz, the senior vice president of NBC News specials. “We have so many platforms and we are putting out our journalism in so many ways that you can’t know how your information might be relevant to somebody else in their work, and you can’t know what other people might bring to a story you’re producing,” he said. While the company is focused on continuing to increase adoption of the product within its own newsroom and add more functionality, Ryan Osborn, NBCUniversal’s vice president for transformation, said he could foresee NBCUniversal News Group potentially licensing the NewsConnect to to other news organizations. At the heart of NewsConnect are news stories — such as the Hillary Clinton email scandal or the Syrian refugee crisis. Within each story, users then add bits of information — think a fact, a video, or a document. 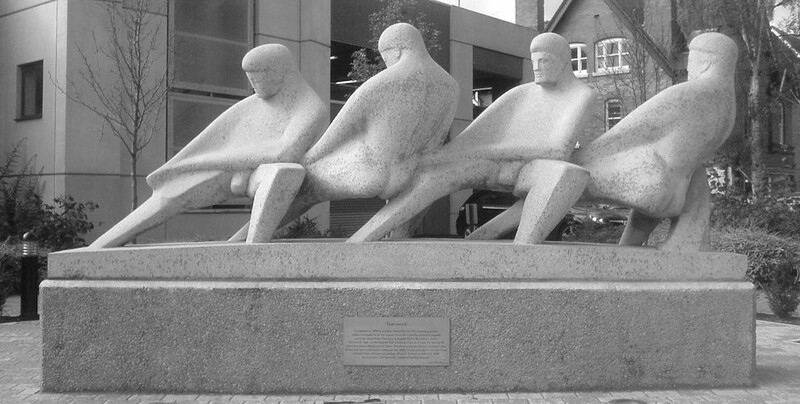 Osborn, who led development of the project, likened the stories to buckets and the facts to balls that fill the buckets. Each story is then listed into three categories: Submitted, Working, and Ready. Stories that are just breaking are filed under the Submitted category. These are stories that may be coming in from NBC’s affiliates, wire reports, or reporters in the field. 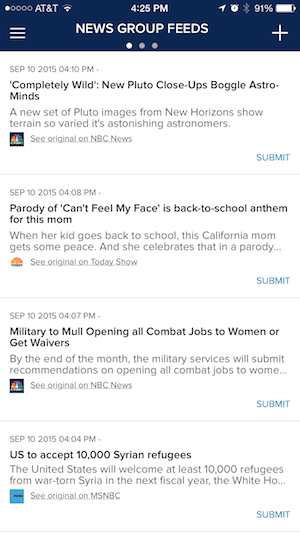 Once NBC has begun working on a story, but is not yet ready to report it, it’s moved to the Working column. And then once the foundation of a story is confirmed and NBC is reporting it publicly, the stories are moved to the Ready column. There are two levels of permissions in the app, editors and journalists. Of the nearly 3,000 NewsConnect users, there are about 100 editors. While anyone can add facts to a story, only the editors can move stories from one column to another. Editors can also add tags to stories to note things such as a story’s importance, whether a story is pending confirmation, or if a certain piece of user-generated content has been cleared to use. Every story also has subject tags attached to it so users can use the metadata to organize stories by topic or search for significant newsmakers, for example. 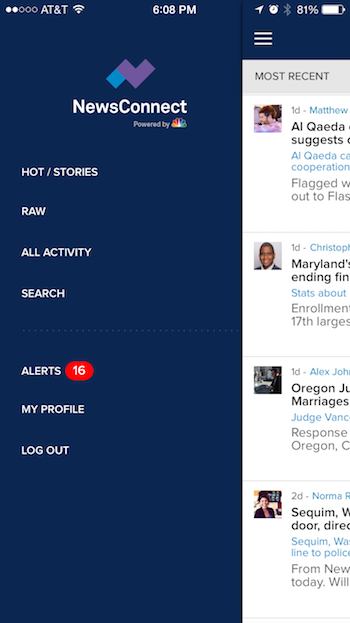 NewsConnect shows users everything that’s published across all of NBC’s websites, and it’s integrated with alerts from Breaking News, which is owned by NBCUniversal. The platform also includes integrations with Twitter, CrowdTangle, and Dataminr in an effort to better utilize social media. There’s a chat function in NewsConnect, too, so users can talk to one another within the platform. “One of the challenges of a legacy news org is that digital output is so prolific in so many ways, and tying a newsroom together, and making sure that users are that focused on producing television are aware of what’s on the website, that’s been a core problem at a lot of places,” said Osborn, who led the development of NewsConnect. The desktop version of NewsConnect is web-based, but NBC also developed a version of the platform as native iOS and Android apps. NBC said it was important to enable its reporters to easily share information while they’re out of the office, which is after all where much of its newsgathering takes place. And the mobile functionality has been key to adoption amongst NBC’s staff, said Lukasiewicz. “We wanted people who were going to use this, to say: This I can make work. When I’m running from the live location to the press conference, I can do this,” he said. NBC began thinking about building an internal tool like NewsConnect after NBC ended its partnership with Microsoft and rebranded its main news website from MSNBC.com to NBCNews.com. Since development of the platform began about two years ago, NBC put together a task force of staffers from across the newsrooms. The group met every Friday for two years, and the development team showed them prototypes and solicited feedback. So when early iterations of the tool flopped, the developers went back to the focus group to learn how it could improve. The team, for example, spent a significant amount of time perfecting the names for the different types of content users can add to stories on NewsConnect, Osborn said. They ultimately called a short piece of text an Update; a video or photo is called an Element; and a Summary is considered a longer writethrough that adds more context and background. “We really got traction within the organization when we started engaging the newsroom stakeholders in a way that said: Let’s bring the language together and really try to recreate the workflow,” Osborn said. Prior to unveiling NewsConnect, NBC used Avid iNews as its main organizational tool, though that program is a TV product that’s useful mostly for tasks such as writing television scripts. To ease the transition, the company ran both systems simultaneously and also offered a number of training sessions for employees throughout the summer. “The training was really critical, and we got tremendously rapid adoption,” said Lukasiewicz. Still, Osborn insisted that “we’re not trying to be everything to everyone,” noting that people across the company are still using tools such as iNews, Evernote, or Gchat or their own purposes. Photo by Kim S. used under a Creative Commons license. POSTED Sept. 21, 2015, 9:45 a.m.
Lichterman, Joseph. 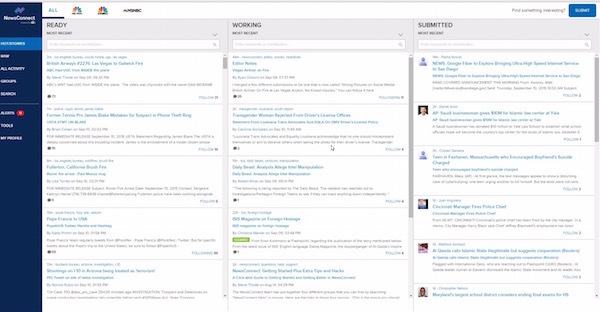 "Working together: How NBC built a new tool to improve collaboration across its newsrooms." Nieman Journalism Lab. Nieman Foundation for Journalism at Harvard, 21 Sep. 2015. Web. 23 Apr. 2019. Lichterman, Joseph. "Working together: How NBC built a new tool to improve collaboration across its newsrooms." Nieman Journalism Lab. Last modified September 21, 2015. Accessed April 23, 2019. https://www.niemanlab.org/2015/09/working-together-how-nbc-built-a-new-tool-to-improve-collaboration-across-its-newsrooms/.